Beer â itâs a manâs drink for a manâs world. Hell, youâve only got to look at the marketing to know that much, right? Wellâ¦ no. Back in medieval times it was the women who did the lionâs share of secular brewing. Indeed, in times when the water supply was often unfit for consumption it was womenâs brewing of ale that kept the peopleâs thirst at bay. 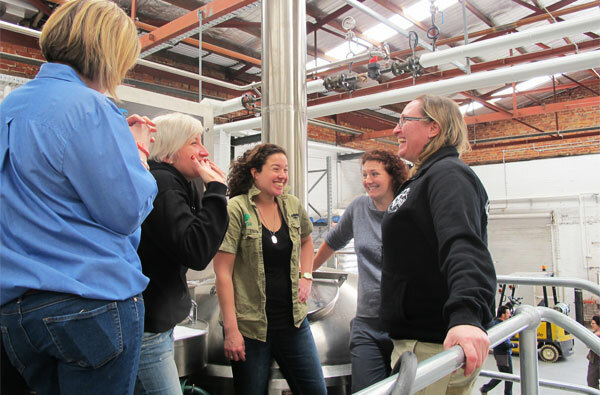 And today, here in Australia, a great many of our talented brewers are women, several of whom were involved in the second Women of Beer Brew Day, which took place earlier this month at Matilda Bayâs shiny new home in Port Melbourne. Last yearâs special brew was 1000 litres of Ninkasiâs Angel, a spiced Belgian tripel. 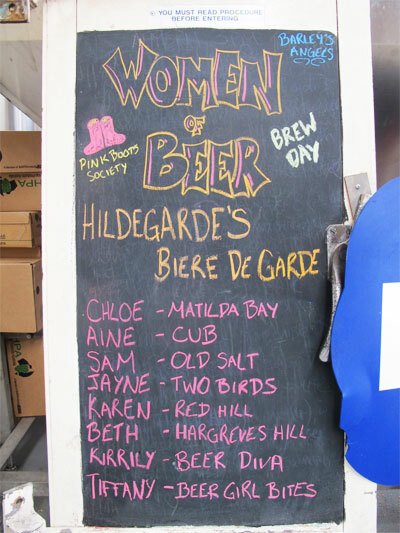 This time around, with double the brew volume, the beer of the day was a biÃ¨re de garde (a French-style ale which means âbeer for keepingâ – see style notes below), poetically named Hildegardeâs BiÃ¨re de Garde. The beer wasnât the only thing to grow; the Women of Beer had increased their number from six to eight. 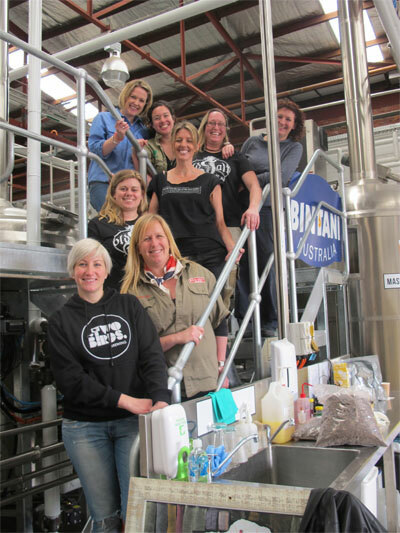 This yearâs team included Matilda Bayâs Chloe Lovatt, CUB’S Aine OâHora, Old Salt’s Sam FÃ¼ss, Two Birdsâ Jayne Lewis, Red Hillâs Karen Golding, Hargreaves Hillâs Beth Williams, Beer Girl Bites' Tiffany Waldron and the Beer Diva, Kirrily Waldhorn. In line with last yearâs brew, Bintani, Cryer Malt and Grain & Grape donated the ingredients, and the brewing facilities came courtesy of this yearâs venue, Matilda Bay. The beerâs proceeds will help raise funds for the Pink Boots Society, which supports and encourages women working within the beer industry through initiatives such as scholarships and practical help for small businesses. Brewing kicked off at 10am with a whopping 500 kilograms of malted barley, the bulk of which was Pilsner. Pilsner malt can lend a beer a delicious and subtle bready flavour as seen in classic Pilsner lagers. Several darker speciality malts were added for extra depth of flavour and colour. This being a French beer, two types of French hop were included. French Triskel (in its commercial Australian debut) was used for bittering, and Strisselspalt provided aroma and flavour. Alongside these expected brewing ingredients was a quantity of French oak chips. Sam described how they would use a large polyester sack to make a giant oaky tea bag that would then be dangled into the fermenter to lend the finished beer a barrel-aged quality. To further add to this aged quality, the beer will undergo a period of cold maturation before being made available mid-November in celebratory champagne bottles. A portion of the beer is destined for kegs and will be available on tap in select craft beer venues. As the brew team went on with their tasks the bar began to fill up with beer lovers keen on sampling the full range of Matilda Bay beers on tap. A gourmet barbecue was fired up so there was plenty of pork action for those who could not live on beer alone. So why biÃ¨re de garde? “Similar to last year, we wanted to brew something special and celebratory for people to enjoy around Christmas time,” said Sam. With two brews under their collective belt it looks like the Women of Beer Brew Day could become a permanent fixture of the craft beer calendar. Are there plans for a 2013 brew? Rest assured, we’ll keep you posted on the beer’s release. BiÃ¨re de garde is a traditional style of ale from the Nord-Pas Calais region in northern France. The style has its roots in the rustic farmhouse ales of the area and with Nord-Pas Calais sharing a border with Belgium, so itâs no surprise that Belgian saisons are a close cousin of French biÃ¨res de garde. BiÃ¨re de garde means âbeer for keepingâ. The âkeepingâ part of the name, la garde, is analogous to the more familiar German term, Lager, which is used by brewers to refer to the cold storage of beer (ale or lager) for the purpose of conditioning. Before the advent of refrigeration, a long period of cold storage was a necessity to ensure a supply during summer. Beer would be brewed in the cooler months in order to avoid the unpredictable effects that hot weather can have on uncontrolled fermentation. Some of these winter-brewed beers were intended to be refreshing summer beers and were therefore stored in wooden barrels until they were needed in the summer months to slake the thirst of many a hot and sweaty French farmhand. The original biÃ¨res de garde would have been quite low in alcohol and most likely have had a tart or sour edge from wild yeasts and bacteria present in the barrels. Over the years, brew house sanitation has meant that biÃ¨res de garde have lost their sour aspect and gained alcoholic strength to become a speciality beer rather than a working man or womanâs thirst-quencher. And thanks to modern fermentation control good beer can now be brewed all year round. However, the storage aspect still remains as commercial breweries will still usually cold condition a biÃ¨re de garde for anything from a few weeks to several months in order to help develop character. A modern day biÃ¨re de garde is a malt-driven ale that is reasonably strong (from 6 to 8 per cent ABV) and often sweet up front with a dry finish that goes well with sunshine, though youâd be well-advised not to slurp too many as they can certainly pack a punch! This article is the first of what we hope will be many for the site from Chris Brady, a man who is consumed by beer: he writes about it, reads about it and brews it. Often the tables are turned and Chris consumes the beer too. If you’d like to make contact, you can do so here.